Kate loves her cheerios. All you have to do is place some cheerios in front of her and she becomes enamored with eating them. She is in her own little world – there is a method to her madness – not sure what it is, but she definitely has a system when it comes to her Cheerios. It is the cutest thing to watch. Here is my new favorite picture….Enjoy! Kate is crawling…I can not think of something more great than watching Kate crawl to something she wants. There is a video below of Kate crawling….take a look! Kate is the definition of life …. Kate is the love of my life. Yes, she is my daughter and she is an amazing being…but every time I interact with her she teaches me something about life – and that makes everything stop. I don’t get to see Kate that often, but when I do she make life stand still. 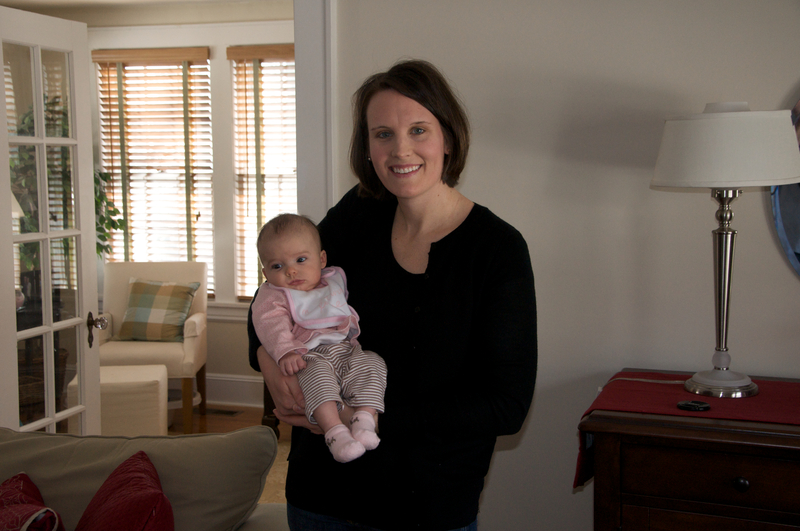 The last time I saw Kate (on Saturday, April 25th, 2009 – she was excited about the day. She was ready with a smile and a laugh, but she feel asleep as soon as I placed her in the car. She slept through our walk through Ohio State’s beautiful campus. Even when the sun got in her eyes (and dad placed his hands up to prevent the sun from interrupting her sleep, she noticed the sun then went back to sleep. She slept through the crowds at the horseshoe (ohio states ginormous football stadium) as throngs of fans screamed for their favorite team. She slept as the sounds of cars and trucks on High street rang through the morning air. Dad was just happy to see his sleeping princess as he rolled her stoller through the students and proud parents during Ohio State’s spring weekend. Once Dad and Kate returned to Mom’s current residence, Kate opened her eyes and was happy to find two loving parents there to greet her. Kate is learning how to eat with a spoon. She has got the bottle thing down to a science, but eating with a spoon is very new to her…and new to dad! Once dad was given a chance to feed her, all bets were off! Dad has no idea how to feed with a 5 month old with a spoon. Kate has no idea how to eat with a spoon, so it was a learning experience for both of us. What an experience it was! Of course, Kate was just learning how to use a spoon…Dad was just learning how to feed Kate with a spoon…what a perfect situation for both of them! Kate was quite hungry, so she knew only that there was food in front of her face. She opened her mouth and dad was ready with a spoon of rice cereal (baby rice mixed with formula or breast milk that brings a new meaning to the term “acquired taste”). Kate learned to open her mouth and Dad learned the right time to move the spoon into her mouth – it was a wonderful experince indeed! Every once in a while, Kate would decide it was time to blow air our her mouth. This was an awesome experience because rice cereal would fly cover everything within a 8 foot radius (including dad and mom) and Dad had no choice but to laugh. 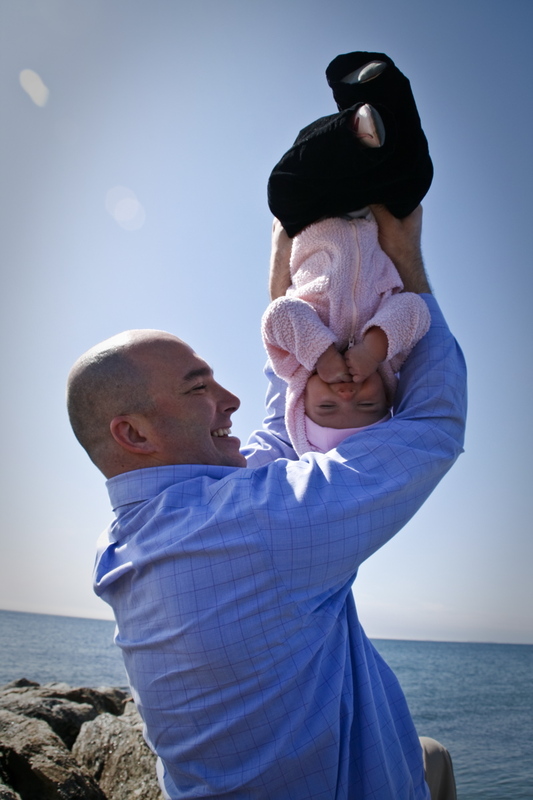 Kate is smart, so she caught on quickly that everytime she repeated the process Dad would laugh — it became a game to her! She would blow, dad would laugh, and she would do it again to see if Dad would repeat his laugh! Dad cannot wait to experience this process again…I am very much looking forward to this weekend! Below is the most recent picture of Dad and Kate – she is the definition of life! Kate has a new blog…. I will update this blog as I can – but times have been busy lately! I never realized how important napping was at this early age. At nearly 4 months old, we are finally on a schedule that Kate seems to like (and we like it too as she is starting to regularly go down for 5-6 hour stretches at night in her crib!). Kate takes her big nap in the morning from 10-12ish and then a smaller nap on both ends since we get up at 7am. For some reason the afternoon nap is a bit harder to put her down. On more than one ocassion, the Snugli has done the job. Thank you Snugli and great job Kate! We love you! For those of you following the story (read the last post), I am happy to say that the Baby Whisperer (aka Dad) has done it again. It is now 1AM and Kate is fast asleep in her crib. While Dad fell asleep on the couch, Mom fed Kate when she woke up and then put her back in her crib (after telling Dad it was time to go to bed). Dad was brushing his teeth, when he could hear Kate slowly taking control of the situation. He swept into the nursery and asked Mom if any assistance was needed. Mom was happy to see the reinforcements arrive and asked to watch me in action! After a few moments, the Baby Whisperer (BW for short) had Kate sleeping. 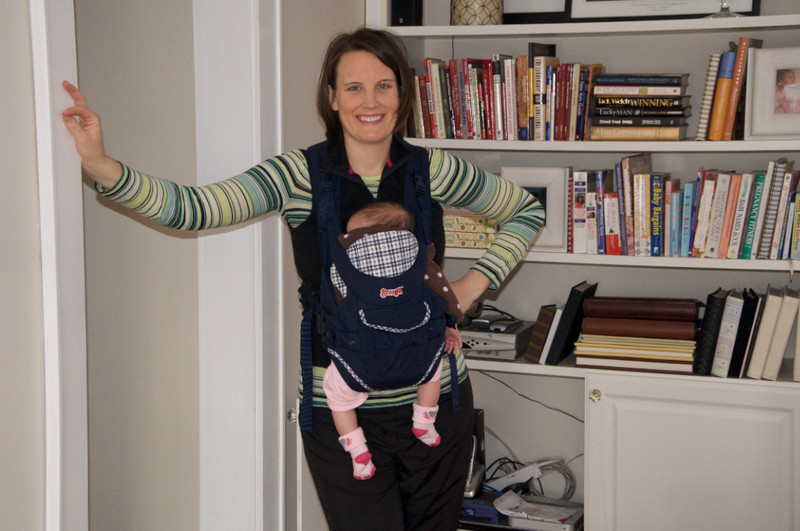 For those of you keeping score – BW 2, Kate 0. Let’s face it – the world revolves around Kate. I know it. Jennifer knows it. You know it. And, of course, Kate knows it. The sun does not rise unless Kate decides she has had enough of tormenting the two people who cater to her every need. 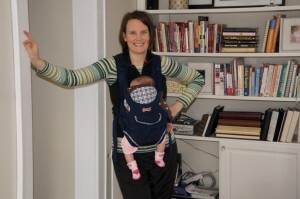 The stars are not aligned until Kate has decided it is time for her to sleep when and where she wants to…UNTIL TONIGHT! It all happened about a week ago. Kate decided she did not like her crib. She was not that crazy about it before, but at least she tolerated being placed in her crib after she fell asleep in daddy’s arms or mommy’s arms. This past week, she would have nothing to do with her crib. Dad would do 25 laps around the house (he actually counts) to make sure she was quite asleep before walking her up to her crib, but the moment he placed her down, she would wake up as if she had been placed on a bed of hot coals. Jennifer started reading every book imaginable. We decided we would try the “pick up put down” method, which essentially means pick her up with she starts crying to soothe her, then put her back down in her crib. This made sense after reading, but in practice it seemed we were just rewarding her crying with what she wanted. We eventually gave up and let Kate sleep when and where she wanted. This often meant letting Kate sleep on our chest or in the swing for 5 hours straight. We eventually decided we had to do something. Tonight, we decided it was time to cut the cord. 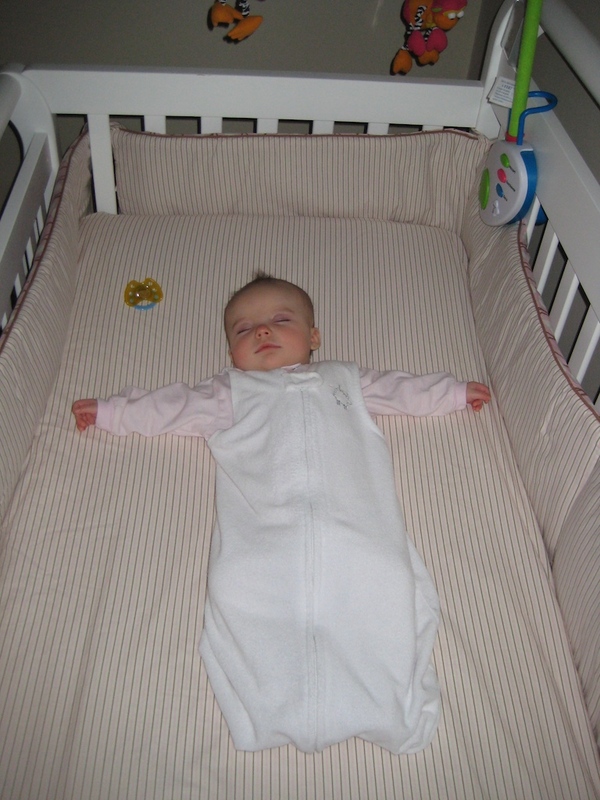 Jennifer and I agreed to put Kate in her crib drowsy, but awake and stay with her until she fell asleep. Kate thought she was smarter than us…she cried the second I put her in the crib and continued to cry. Jennifer was in bed trying to resist that motherly urge to stop her baby’s hurt, but Dad suggested she wait. Mom relented and went back to bed, throwing her hands up at the possibility that Dad could possibly get our beautiful center of the universe back to bed without her resenting us for a lifetime for letting her cry. Dad’s heart fell for Mom and in the same motion determined to create a comfortable environment for his little bundle of joy to sleep in peace. I went back to Kate’s crib and rubbed her stomach. She cried and cried and cried. I talked to her in a soothing voice…and she cried. I continued to stroke her stomach and calm her with soft tones until eventually …. she fell asleep! I did it! It was the best feeling in the world! My little princess fell asleep without 25 laps around the house! So…it is now 9:30 pm. I won the battle…but the war just began. The next battle begins around 1am … and I am prepared…I just hope that Mom will be! Now that Valentine’s Day has passed, we are looking forward to our favorite holiday here in the O’Connor household: St. Patrick’s Day! 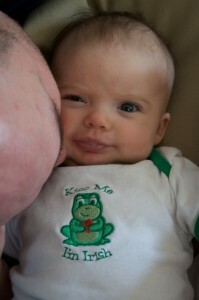 Of course, Kate couldn’t wait to put on her favorite onesie, and Dad couldn’t resist giving her a kiss. Look at those Irish eyes. Kate and I moments before our guest's arrival. 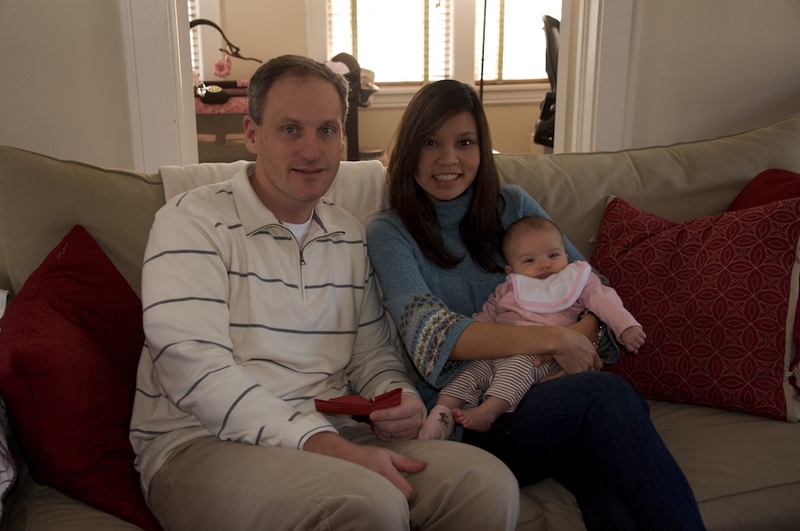 On November 5, 2008, John and I had plans to attend an authentic Thai dinner hosted by my boss, Chris Dalo, and his wife at their house in Southport, CT. John and I were the first to arrive. Right before the first glass of wine got poured, I noticed something wasn’t right. It turns out my water broke then and there! John and I quickly dashed out of the house and called my doctor who told us to head to the hospital. Kate was born the next day. John and I were so sad that we missed such a fantastic meal. My boss vowed to make it up to us. We laughed and never thought much of it. Chris and Tang with Kate. To our surprise, on Sunday, January 25, we actually had the meal at our house. Chris and his wife, Tang, cooked three wonderful entrees and two yummy desserts. We were so grateful!